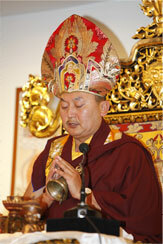 Tulku Pema Rigtsal (b. 1963) is a contemporary lama and monk of the Nyingma tradition, whose main area of activity is in Humla, a remote area in the northwest of Nepal. He is one of the main Dudjom Tersar holders in Nepal. Tulku Pema Rigtsal (or Riksal) was born in 1963; his father was the Second Degyal Rinpoche and his mother Kyama Tsering. At the age of three, he was recognized by Dudjom Rinpoche and Ling Rinpoche as the reincarnation of Chimme Rinpoche, the head lama of Ngari Pureng She Pheling Monastery. His main enthronement ceremony was held in 1977 at the Shedphel Ling Monastery at Mongod, India, which was overseen by Pema Kundol Rinpoche. His brother was Shiva Rinpoche, the reincarnation of Golok Serta Rinpoche. Until the age of nineteen, Tulku Pema Rigtsal received an early education in reading, writing and ritual practices with his father the Second Degyal Rinpoche. He especially received from him all the practices of the Dudjom Tersar. After, and during more than ten years, Tulku Pema Rigtsal, accompanied by Khenchen Dawai Wozer, received teachings from Khenchen Choying Khyabdal Rinpoche. He has completed a closed three-year retreat, and a six-month retreat as well. In 1985, in Humla Yolwang, in the far northwest of Nepal, he established Namkha Khyung Dzong monastery, which follows the Dudjom Tersar tradition. There, Tulku Pema Rigtsal has given to about 150 monks teachings on the sutras, tantras, the Shyung Chenpo Chusum, with a special emphasis on the wisdom view of Mipham Rinpoche. Tulku Pema Rigtsal gives teachings on the Dudjom Tersar Ngöndro, the The Words of My Perfect Teacher, Bodhicharyavatara, and the Richö, Nang Jang, Neluk Rangjung, and other Dudjom Tersar teachings, to the people of Humla and those from the Ngari part of Tibet. Tulku Pema Rigtsal also holds Summer and Winter Dharma Teaching sessions every year for more than five hundred practitioners including monks, ngakpas (yogis) and nuns residing in Humla and Ngari, Tibet. Hundreds of hermits are practising in caves and solitary locations in Humla, Nepal and Ngari, Tibet under his instruction and guidance. Besides Nepal, Tibet and India, Rinpoche has many disciples in Taiwan, Singapore, Hong Kong and the U.S.A..
a biography of the Degyal Rinpoche (the first). his first book in Tibetan, entitled “Semkyi Sangwa Ngontu Phyungwa” (The Great Secret of Mind). This page was last edited on 17 February 2019, at 08:45.